Team North America head coach Todd McLellan has "young experience" on his squad that may end up playing a key role in the World Cup of Hockey. While teenagers like Connor McDavid and Auston Matthews will get most of the attention during the eight-team tournament, there are a handful of players on the roster who are not all that young, at least in terms of NHL experience. Ryan Nugent-Hopkins of the Edmonton Oilers and Sean Couturier of the Philadelphia Flyers have spent the past five seasons in the NHL, piling up more than 300 games apiece. Brandon Saad of the Columbus Blue Jackets has played 286 regular season games in four seasons, but also has 67 playoff games under his belt and won a pair of Stanley Cups while with the Chicago Blackhawks. "There are times in games and in locker-rooms where we'll have to settle down a bit," McLellan said Wednesday. "We may get running around. Not panicking, but a little nervous. The North American team includes players from Canada and the United States who are 23 or younger. Couturier, who has a team-high 350 NHL games on his resume, is centring the checking line with Vincent Trocheck of the Florida Panthers (146 games) and J.T. Miller of the New York Rangers (196) and is expected to be a top penalty killer. "I was lucky enough to have him at the world championships in 2015," said McLellan. "He played a huge role in our success there. "Very good at penalty killing and in the faceoff circle. Responsible all over the rink. It's nice to have that type of player on your team." Others with significant experience include Mark Scheifele of the Winnipeg Jets with 227 games, MacKinnon of the Colorado Avalanche with 218 and three defencemen: Seth Jones of the Nashville Predators with 240, Morgan Reilly of the Toronto Maple Leafs with 236 and Jacob Trouba of the Jets with 211. Nugent-Hopkins is aware that the older youngsters will be looked to for leadership. "I've been around," the 23-year-old said. "I'm going into my sixth season now, which is kind of crazy when you think about it. "But I have experience at the pro level. I need to lead by example, not just on the ice. It's away from the rink a lot. Doing things right. Taking care of myself. Hopefully, the young guys see that and learn from that. There's a lot of other older guys too. We've got a good mix." Goalie Matt Murray has made only 13 regular-season appearances, but he did backstop the Pittsburgh Penguins to a Stanley Cup. He is among eight players with less than 100 NHL games. That includes Matthews, the 2016 first overall draft pick who has yet to play in the NHL but got valuable experience last season playing against professionals in the Swiss league. 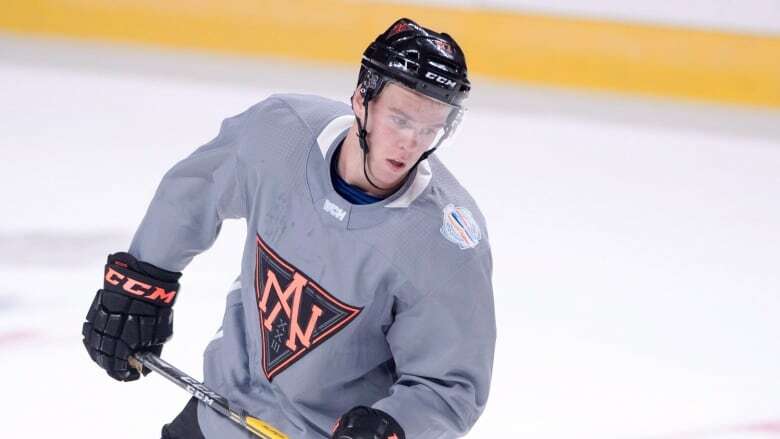 An injury limited 2015 first overall pick McDavid to only 45 games in his rookie season, but he is the favourite to be named captain. The coaches look to have made an effort to surround younger players with veterans in the dressing room. Matthews is seated between Couturier and Saad, who is next to McDavid and Scheifele. "There will be those 'settle down' moments, and that's where that young experience has to step up and say, 'We're fine, some of us have been here before. Let's relax, rely on each other and our structure and go from there," said McLellan. After three days of workouts at the Bell Centre, Team North America sees its first game action Thursday night in a pre-tournament game against Team Europe in Quebec City. The two teams meet again Sunday in Montreal. McLellan said he has yet to decide who will start in goal. Murray is the front-runner for the job, but John Gibson of the Anaheim Ducks and Connor Hellebuyck of Winnipeg are in the hunt. McLellan wants to identify a starter and a backup, while the third netminder will likely see little — if any — ice time.